A half-shekel—to allude to the shekalim contributed by the people of Israel, a half-shekel per head (Rashi ad loc). The first marriage of which we read in the Torah is the marriage of Adam and Eve. Theirs, of course, was a marriage wholly made in Heaven: G‑d Himself created the bride, perfumed and bejeweled her, and presented her to the groom. The first instance in which the Torah tells the story of a marriage achieved by human effort is in the chapter that describes the search for a bride for Isaac. Here are detailed the workings of a conventional shidduch: a matchmaker (Abraham’s servant Eliezer), an investigation into the prospective bride’s family and character, a dowry, the initial encounter between the bride and groom, and so on. The Torah, which often conveys complex laws by means of a single word or letter, devotes no less than 67 verses to the marriage of Isaac and Rebecca. Many of the details are related twice—first in the Torah’s account of their occurrence, and a second time in Eliezer’s speech to Rebecca’s parents. For here we are being presented with a prototype to guide our own approach to marriage—both in the conventional sense as the union of two human beings, and in the cosmic sense as the relationship between G‑d and man. Each man shall give the ransom of his soul to G‑d. . . . This they shall give: . . . a half-shekel. . . . A shekel is twenty gerah; a half-shekel [shall be given] as an offering to G‑d. . . . The rich man should not give more, and the pauper should not give less, than the half-shekel . . .
Why half a shekel? Maimonides writes that as a rule, “everything that is for the sake of G‑d should be of the best and most beautiful. When one builds a house of prayer, it should be more beautiful than his own dwelling. When one feeds the hungry, he should feed him of the best and sweetest of his table. . . . Whenever one designates something for a holy purpose, he should sanctify the finest of his possessions, as it is written (Leviticus 3:16), ‘The choicest to G‑d’” (Mishneh Torah, Hil. Issurei Mizbe’ach 7:11). Indeed, in many cases Torah law mandates that the object of a mitzvah (Divine commandment) be tamim, whole: a blemished animal cannot be brought as an offering to G‑d, nor can a blemished etrog be included in the Four Species taken on the festival of Sukkot. Even when this is not an absolute requirement, the law states that whenever possible, one should strive to fulfill a mitzvah with a whole object. For example, it is preferable to recite a blessing on a whole fruit or a whole loaf of bread, rather than on a slice (hence our use of two whole loaves at all Shabbat and festival meals). Why, then, does the Torah instruct that each Jew contribute half a shekel towards the building of a dwelling for G‑d within the Israelite camp? The Torah’s repeated reference to this contribution as a “half-shekel” is all the more puzzling in light of the fact that in these very same verses the Torah finds it necessary to clarify that a shekel consists of twenty gerah. In other words, the amount contributed by each Jew as “the ransom of his soul” was ten gerah. Ten is a number that connotes completeness and perfection: the entire Torah is encapsulated within the Ten Commandments; the world was created with ten Divine utterances; G‑d relates to His creation via ten sefirot (Divine attributes); and the soul of man, formed in the image of G‑d, is likewise comprised of ten powers. But instead of instructing to give ten gerah, the Torah says to give half of a twenty-gerah shekel, deliberately avoiding mention of the number ten and emphasizing the “half” element of our contribution to the Divine dwelling in our midst. For such is the essence of marriage. If each partner approaches the marriage with a sense of his or her self as a complete entity, they will at best achieve only a “relationship” between two distinct, self-contained lives. But marriage is much more than that. 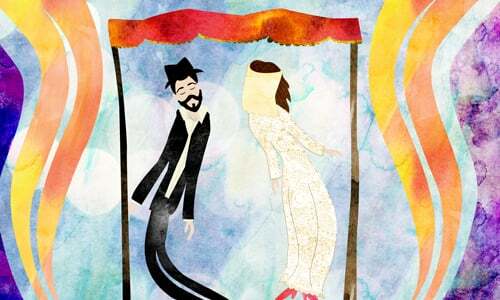 The Kabbalists explain that husband and wife are the male and female aspects of a single soul, born into two different bodies; for many years they live separate lives, often at a great distance from each other and wholly unaware of the other’s existence. But Divine providence contrives to bring them together again under the wedding canopy and accord them the opportunity to become one again: not only one in essence, but also one on all levels—in their conscious thoughts and feelings and in their physical lives. Marriage is thus more than the union of two individuals. It is the reunion of a halved soul, the fusion of two lives originally and intrinsically one. To experience this reunion, each must approach his or her life together not as a “ten,” but as a half. This half-shekel consists of ten gerah—each must give their all to the marriage, devoting to it the full array of resources and potentials they possess. But each must regard him- or herself not as a complete being, but as a partner—a part seeking its other part to make it whole again. The half-shekel ring given to Rebecca for her marriage to Isaac was the forerunner of the half-shekel contributed by each Jew towards the building of the Sanctuary, the marital home in the marriage between G‑d and man. The soul of man is “a part of G‑d above”—a part that descended to a world whose mundanity and materiality conspire to distance it from its supernal source. So even a soul who is in full possession of her ten powers is still but a part. And even when G‑d fully manifests the ten attributes of His involvement with His creation, He is still only partly present in our world. It is only when these two parts unite in marriage that their original wholeness and integrity is restored. So to build G‑d a home on earth, we must contribute half of a 20-gerah shekel. We must give ourselves fully to Him, devoting the full spectrum of our ten powers and potentials to our marriage with Him. But even as we achieve the utmost in self-realization in our relationship with G‑d, we must be permeated with a sense of our halfness—with the recognition and appreciation that we, as He, are incomplete without each other. Half-Shekhel Is it possible that we as humans reflect G-d? Devon's answer No problem with your interpretation. I accept it as valid. G-d's Shechina is always close by, especially Shabbat. When Moshiach comes it is G-d's Shechina that will dwell in the third Holy Temple. However, your answer does not satisfy me. Sometimes it goes that way. The author knows what he means. I stand by my question. What is meant by G-d being incomplete ? For whatever reason, the perfection of G-d has been drilled into me. The author is contradicting this notion. I am not broken hearted by any means. But rather in need of an exacting answer by the author. I want to know the author's specific context. G-d is perfect. Perfect means complete. He is incomplete ? How can He, G-d, who is perfect, be incomplete. I suppose that i am taking this out of context. It just strikes me as so off track. Everything else fits.